Broadfork - Break open compacted soils,cultivator & aerator. 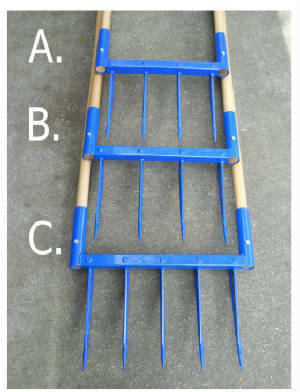 The broadfork is a gardening tool that is widely used in Europe and is growing in popularity in the USA. 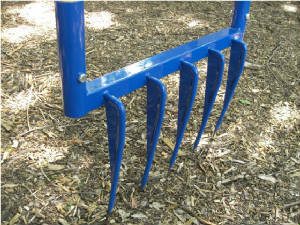 Broadforks are excellent for breaking open compacted soils deeper than with a rototiller or a spade. This tool will deeply aerate your soil, increase water percolation, and preserve soil structure. In comparison, a rototiller pulverizes soil into a fine dust that compacts and hardens after the first rains. The 12” tines are 2” longer than the main competitor’s broadforks. It is best to broadcast compost and soil amendments prior to broadforking, as the amendments will trickle down into the cracks. This is especially useful for rock phosphate, since phosphorus is leached very slowly. 1. The ½” tines are reinforced with ¼” welded steel gussets. These strengthened tines are much more resistant to bending than most broadfork tines. 2. The tines are turned to a point instead of cut at an angle. This reduces resistance. 3. The handles are ash post hole digger handles, 1½" in diameter. Replacement handles are widely available for about $10 each. 4. Stout wooden handles, stiffer tines, and a wider treadbar make for a tool that is durable, reliable, and easier on your body. Watch the Videos to See our Broadforks in action! 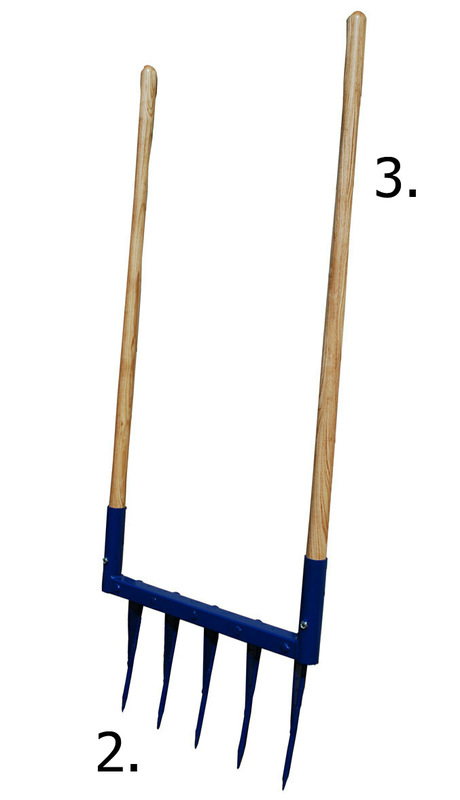 My hard-pan creating, petroleum driven, worm pulverizing mechanized monster has been effectively replaced by this simple tool that maximizes human effort and works with nature… The ease with which one can significantly improve soil composition to a depth of 12" is remarkable. The engineering is superb as is the quality of the materials an workmanship... I just bought a "human powered" rototiller... I wouldn't trade it for anythning I've used in the past to work up a seed bed. 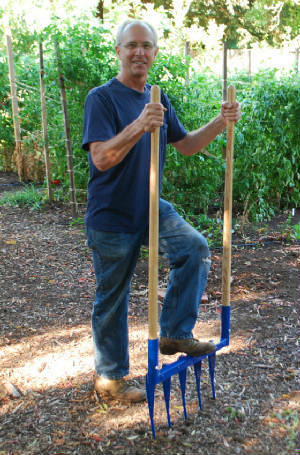 It’s just dandy – I just used it to turn the beds for my potatoes and it worked great.